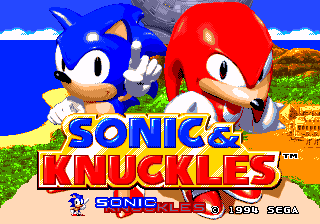 Sonic & Knuckles (ソニック＆ナックルズ) is the direct sequel to Sonic the Hedgehog 3 on the Sega Mega Drive. Released in the same year as its predecessor, the game was the first to boast the ability of "Lock-On Technology," which allowed the game to interact with past Sonic the Hedgehog titles. It is the second half of what some consider the greatest Sonic game of all (Sonic 3 & Knuckles) and the final part in the "Death Egg Saga". It was also the last Sonic game led by Director Hirokazu Yasuhara. Being the swan song not just for Yasuhara but ultimately being the final Sonic game released through the Sega Technical Institute, many people consider the game to be the end of the "classic" series begun with the first Sonic the Hedgehog. The story to Sonic & Knuckles. Being airlifted back to Earth by "Tails," Sonic and his two-tailed friend landed in the Mushroom Hill Zone, a lush forest full of oversized versions of its namesake. Quickly getting his bearings, Sonic looked about, seeing the still-existing form of the Death Egg sitting upon the mountain. Immediately annoyed by the fact it survived yet another crash landing, Sonic realized that Dr. Eggman would not give up on the flying fortress until it was completely destroyed. Knowing his time was not yet over on the island, Sonic spotted a familiar red figure out of the corner of his eye. Being sure to stay out of the Echidna's view, Sonic watched as Knuckles peaked his head around a doorway hidden in a thicket before running off, the door closing behind him. Once he was sure the guardian was gone, Sonic walked over to the doorway, pressing a nearby button and letting himself inside. Sonic the Hedgehog entering the Emerald Shrine for the first time. When his eyes opened again, Sonic found himself in a place he had never been in before, a solemn, ornate alter inside a giant room. Looking upon it, he could see seven empty spots built around a centerpiece, which contained a gigantic emerald. In shock, Sonic did not yet realize that this was the Master Emerald, a source of immense power connected to the Chaos Emeralds, and the reason the island floated before Eggman's intervention. "The "Sonic the Hedgehog" adventure on the "floating island" is underway and there is still more to come!" Sonic the Hedgehog in Dr. Eggman's other flying fortress, Flying Battery Zone. Essentially being Sonic the Hedgehog 3 Part 2, Sonic & Knuckles plays exactly like its predecessor. When controlling Sonic the Hedgehog, all of the same moves available to him in Sonic 3 are retained: the spin attack, the spin dash and the W spin attack make up the bulk of his repertoire. With these three standard moves, Sonic must run through each "Act" of the seven "Zones" under the ten minute mark, all while avoiding badniks, spikes, and an assortment of other dangerous pratfalls that come along his way. Rings, springs, loop-de-loops, and all the standard elements of the Sonic games thus far are also retained, as well as the various item boxes that are scattered throughout each level. The entire collection of power-ups available in Sonic 3 return: Speed, Invincibility, 1-ups, the Eggman box and the three new shields. The "Thunder Barrier, "Flame Barrier," and "Aqua Barrier" all retain the same abilities as the last game, although with a lack of water in any of the Sonic & Knuckles stages the Aqua Barrier's ability to allow Sonic to breathe underwater is unutilized. Knuckles the Echidna gliding through the Mushroom Hill Zone. Though "Tails" is absent as a playable character in the standalone version of Sonic & Knuckles, the other title character, Knuckles the Echidna, is presented as an option on the title screen. When chosen, a short cutscene occurs, placing the game after the events of Sonic's game, Knuckles being terrorized by an Eggrobo that survived Sonic's run through the island. Possessing the same spin attack and spin dash moves as Sonic, Knuckles is also given a variety of his own unique skills that make him stand out. When a player presses the jump button twice on the control pad, Knuckles has the ability to glide, slowly descending back to the ground as he does so. If he so happens to run into a wall during this decent, he immediately grabs hold, able to climb up a variety of surfaces to let him reach higher ground. The knuckled fists that let him do the climb also come in handy when he comes across various blockades in his path. Though Sonic is forced to spin dash through certain blocks (and is completely unable to break through others), Knuckles needs to only run ahead, his fists forward, giving him access to pathways in the level that Sonic can not get to. Regardless of who you're playing as, running past the many Star Posts that litter each Zone with a certain amount of rings will cause a familiar circle of stars to surround the top of the checkpoint. As opposed to Sonic 3's single Bonus Stage, Sonic & Knuckles comes packed in with two. The first, accessible if you have between 20 and 34 rings, is a stage reminiscent of the Special Stage from the first Sonic the Hedgehog. Rotating at the same 360 degree angle, the center of the psudo-maze features a slot machine similar to those from the Casino Night Zone of Sonic the Hedgehog 2. The second, playable if you pass a checkpoint with 35 rings or more, features a room full of bumpers and flippers, along with numerous glowing spheres that Sonic is attracted to. Spinning around them, the player must push the jump button to pull away from its gravity, the direction Sonic or Knuckles if facing determining which way they will go. Sonic and Knuckles confrontation in the Hidden Palace Zone. Special Stages and the Chaos Emeralds within also return, accessible by finding one of the mysterious giant rings hidden in the levels. The stage plays exactly like the ones in Sonic 3, where Sonic or Knuckles must collect all of the blue spheres and avoid the red ones. Only available through the Lava Reef Zone, collecting all seven of the emeralds with either Sonic or Knuckles allows them to transform into their respective super states, Super Sonic and Super Knuckles. Needing fifty rings to make the transformation, pressing the jump button twice will allow the characters to zoom through the levels at blazing speeds, neigh invulnerable to boot. Collecting the Chaos Emeralds also serves a greater purpose in the game. While using either character and collecting them will unlock the good ending, collecting all seven using Sonic will unlock an extra 8th level, the Doomsday Zone. Playing significantly different than the previous levels, it provides the perfect backdrop to wrapping up the "Death Egg Saga" started in the previous two games. This extra level is not available in Knuckles' game, which wraps up in the Sky Sanctuary Zone, meaning he is also not normally playable in the Death Egg Zone. This shortened amount of levels is made up by the fact that Knuckles' game is considerably harder than Sonic's, with the final boss of the game being completely different. Sonic 3 & Knuckles - Playable when connecting Sonic the Hedgehog 3. Allows the full game to be accessed, with Sonic, "Tails" and Knuckles playable in both halves. Knuckles the Echidna in Sonic the Hedgehog 2 - Playable when connecting Sonic the Hedgehog 2. Allows Knuckles to play through the game, with subtle design differences to take advantage of his unique moveset. Blue Sphere - Playable when connecting Sonic the Hedgehog. Allows numerous interpretations of the Sonic 3 and Sonic & Knuckles Special Stages to be played, providing a sixteen-number password to pick up where the player left off. 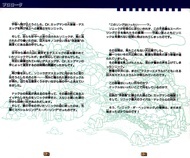 Though advertised as being "backward compatible," there is evidence in the original Sonic 3 that the Lock-On Technology of Sonic & Knuckles was planned from the start, with pointers in the game code detailing where various changes in Sonic 3's level design would be when the two are connected. Hitting bumpers: 10 points for each of the first ten hits on any given bumper; after that no more points can be gained from that bumper. Signpost: At the end of each Act 1, a signpost falls from the air; jump at it before it hits the ground to keep it in the air and score 100 points. You can get as many 100-point bonuses as you're able to keep the sign in the air for. Special stage: 100 points for each ring held. If you collect all rings, you also get a 50,000-point Perfect Bonus (even if you don't get the Emerald). The level select to Sonic & Knuckles, which contains the sound test. Below is a listing of the songs available to be played through the sound test within the game, accessible through the level select code. Tracks 01 - 08 and Tracks 0B - 0E are not playable because the acts associated with the zones are located in Sonic the Hedgehog 3. Track 1E is not playable because the bonus stage is not in Sonic & Knuckles. Tracks 20 - 24 are not playable because the acts associated with the tracks are in the Competition Mode, which is located in Sonic the Hedgehog 3. Track 26 is not playable because it is the track played during the credits for Sonic the Hedgehog 3. Track 2D is not playable because it is played during the setup of Competition Mode, which is located in Sonic the Hedgehog 3. Track 31 is not playable because it is the "Drowning" theme. All of the zones in Sonic & Knuckles have no water. NOTE: In Sonic Classic Collection, the mid-boss music for Sonic & Knuckles is reverted to its original Sonic 3 track. However, the same was not done for Sonic 3 & Knuckles. Being the direct continuation of Sonic the Hedgehog 3, it only made sense that both Archie Comics and Fleetway would create comic book adaptations in their respective comics based on Sonic the Hedgehog. For Archie, the comic was published not in the main series but in the 48-page special Sonic & Knuckles. Though taking place on the "Floating Island" and using selected set pieces from the game, the plot was largely unrelated to the game, neglecting the Death Egg entirely. Instead, the Death Egg would be utilized in the "Sonic Quest" mini-series. For Sonic the Comic, the "Death Egg Saga" would begin in issue 43 and continue on through issue 53. The game was also loosely adapted in the American junior novel Sonic & Knuckles by Michael Teitelbaum. A complete list of Sonic & Knuckles disassemblies. View the disassembly on GitHub. Sonic Community Hacking Guide/Sonic 3 & Knuckles - Also applies to Sonic & Knuckles alone.